After two weeks of writing reviews like this, you should know by now that, while I am a big Hans Zimmer fan (I have eleven film scores in which he’s listed as the main or co-composer), my main criticism is that LOTS of his music sounds the same. However, in choosing to review one of his scores, I have decided to put aside these criticisms in order to focus on this score and this one alone. I could go on and on about how certain tracks sound like Zimmer’s music from other films, but I won’t. So here you go: my review of Hans Zimmer’s score to Christopher Nolan’s 2010 film, Inception. I suppose that the genius of this score, aside from using a more contemporary orchestration for much of it (i.e. it’s very electronics-heavy), is that the “theme” or “motif” most associated with this film is so simple. Heard from the starting moments of the album with the track “Half Remembered Dream”, this two-note motif is heard often throughout the film, and it’s quite effective. Its simplicity makes it all the more recognizable whenever it pops up in later tracks, like in “Dream is Collapsing” and “Dream Within a Dream”. For those who don’t know, this motif is derived from the French song featured prominently in the film, “Non, je ne regrette rien”; you can hear it in the intro to the song, before Edith Piaf starts singing. There is even one moment in “Waiting for a Train” when the French song and the motif are played back-to-back, so listen out for that! The music that leads up to this motif is the same in every track but the first, since the motif is meant to indicate that the time left in the dream is coming to an end. This pre-motif music consists of (what I’m assuming is) eighth notes in 3/4 time, with a dip in pitch and emphasis on beat 1 of the second set of 3. Again, this is simple but quite effective in building the excitement up to the point when time is up. Parts of this score are hard to describe, but I suppose that an appropriate description would be “contemplative”. I’m referring to tracks such as “Radical Notion”, “One Simple Idea”, and much of “Waiting for a Train”, in which one short phrase is repeated pretty much throughout the entirety of the track. Tracks like these fit because the film itself is largely contemplative; that is to say, it makes you think a lot. These tracks are largely out of the way and meant to be truly background to the events unfolding on screen, perhaps playing during moments when the current focus is exposition/explanation. Very smart of Mr. Zimmer to know when the focus is less on music and more on film content, and, despite the fact that they’re “out of the way”, he manages to make them actual contributions to the film, rather than just filler nonsense made to take up sound. Well, there you have it. 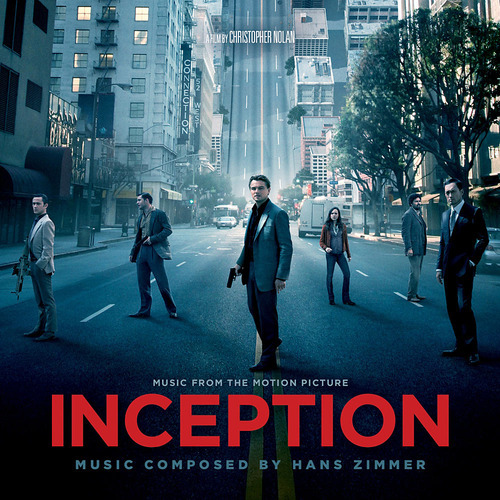 When I first bought this soundtrack a year and a half or so ago, I expected it to sound like all of Hans Zimmer’s other stuff, but was pleasantly surprised and refreshed; for the most part, Inception features some of the most original stuff that I’ve ever heard from Zimmer. In fact, my disclaimer at the start of this review was probably actually unnecessary for this score. Kudos to you, Hans. My favorite track, and by far the most fantastic from the album, is Zimmer’s beautiful/simple/contemplative composition “Time”, which contains themes that have been hinted at in earlier tracks such as “We Built Our Own World” and “Paradox”. Check this score out. I don’t think you’ll regret it – and this is coming from a harsh Zimmer critic. Total Length: app. 50 min. This entry was posted on Wednesday, July 11th, 2012 at 11:34 pm	and tagged with chadadada, chadlikesmovies, Christopher Nolan, Hans Zimmer, Inception, Soundtrack of the Day, soundtrackoftheday and posted in 5, Entertainment, Film, Movies, Music, Scores, Soundtrack Reviews. You can follow any responses to this entry through the RSS 2.0 feed.